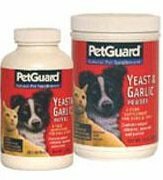 PetGuard Yeast and Garlic Powder , sprinkled on your pet's food, and Yeast and Garlic Wafers, given as a treat or reward, will nourish and strengthen your pet naturally with protein and the essential B-Complex Vitamins. Used regularly, yeast and garlic will help your pet be healthier, happier, more disease resistant and less prone to problems associated with infestation. Our Yeast and Garlic products help your pet to maintain a healthy appetite and protect against anemia. Yeast and Garlic not only supplies B Vitamins but also is a valued source of trace minerals and B-Complex Vitamins. Protein and trace minerals are essential nutrients necessary for enhancing your pet's vitality and stamina and work to build your pet's natural immune system. 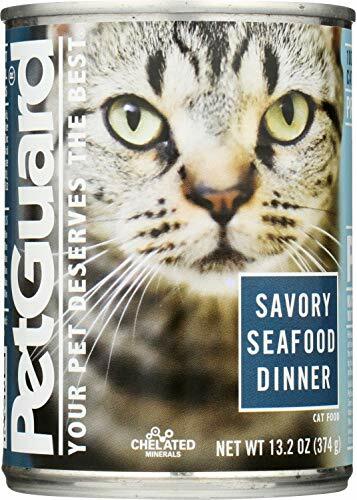 PetGuard Savory Seafood canned cat food is a complete diet containing everything your cat needs without any of the ingredients you want to avoid. Real Salmon is the first ingredient. Free of animal by-products, artificial flavors, colors, preservatives, sweeteners and sugar. Viitamins and chelated minerals and are rich in Omega-3 and Omega-6 fatty acids for healthy skin and coat. PetGuard was founded in 1979 as the first all-natural pet food company. PetGuard is family-owned and focused on bringing quality, natural nutrition to your pets. Made in the USA. INGREDIENTS: SALMON, MACKEREL, WATER SUFFICIENT FOR PROCESSING, OCEAN FISH, RICE FLOUR, CHICKEN LIVER, SHRIMP, BREWERS DRIED YEAST, GUAR GUM, POTASSIUM CHLORIDE, CHOLINE CHLORIDE, SUNFLOWER OIL, DRIED KELP, DL-METHIONINE, TAURINE, YUCCA SCHIDIGERA EXTRACT, ZINC AMINO ACID CHELATE, IRON AMINO ACID CHELATE, VITAMIN E SUPPLEMENT, NIACIN, COPPER AMINO ACID CHELATE, MANGANESE AMINO ACID CHELATE, D-CALCIUM PANTOTHENATE, THIAMINE MONONITRATE (VITAMIN B1), VITAMIN A SUPPLEMENT, SODIUM SELENITE, RIBOFLAVIN SUPPLEMENT (VITAMIN B2), PYRIDOXINE HYDROCHLORIDE (VITAMIN B6), ERGOCALCIFEROL (SOURCE OF VITAMIN D2), VITAMIN B12 SUPPLEMENT, CALCIUM IODATE, BIOTIN, COBALT AMINO ACID CHELATE, FOLIC ACID, INOSITOL. PetGuard LifeSpan was the first all natural super premium holistic dry food for dogs of all ages, sizes and breeds. 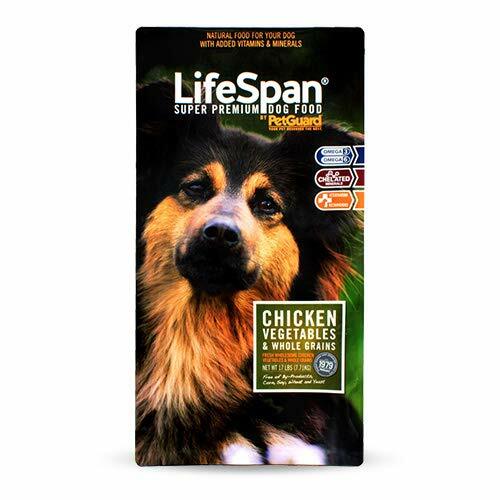 These crunchy nuggets provide your dog with optimum nutrition in a scientifc blend of real chicken, whole grains, essential vitamins and chelated minersals. 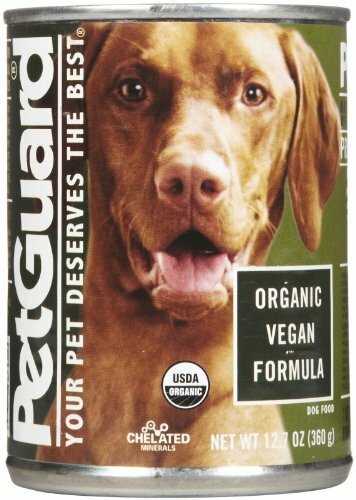 Free of animal by-products, artificial flavors, colors, preservatives, sweeteners and sugar.Our formula contains Vitamins, chelated minerals and it is rich Omega-3 and Omega-6 fatty acids for healthy heart, liver, kidneys, skin and coat.PetGuard was founded in 1979 as the first all-natural pet food company. PetGuard is family-owned and focused on bringing quality, natural nutrition to your pets. 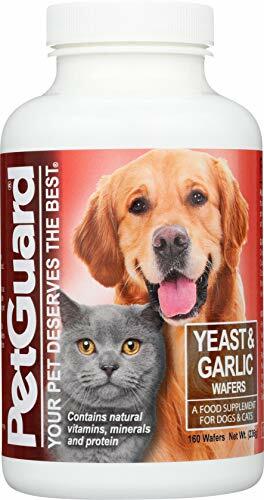 PetGuard Yeast and Garlic Powder, sprinkled on your dog or cat's food will nourish and strengthen your pet naturally with protein and the essential B-Complex Vitamins. Used regularly, Yeast and Garlic will help your pet be healthier, happier, more disease resistant and less prone to problems associated with infestation. Made with human-grade ingredients. Our Yeast and Garlic products help your pet to maintain a healthy appetite and protect against anemia. Yeast and Garlic not only supply B Vitamins but also are a valued source of trace minerals and B-Complex Vitamins. Protein and trace minerals are essential nutrients necessary for enhancing your pet's vitality and stamina and work to build your pet's natural immune system. PetGuard was founded in 1979 as the first all-natural pet food company. PetGuard is family-owned and focused on bringing quality, natural nutrition to your pets. Made in the USA. 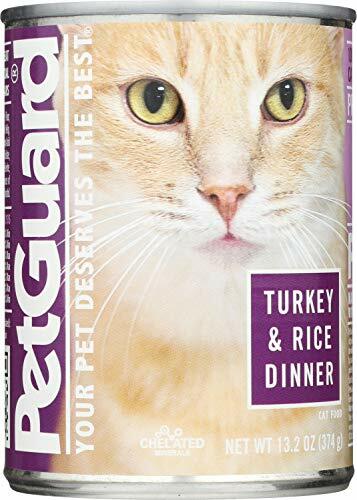 PetGuard Turkey & Rice Dinner canned cat food is a complete diet containing everything your cat needs without any of the ingredients you want to avoid. 100% Turkey is the first ingredient. Free of animal by-products, artificial flavors, colors, preservatives, sweeteners and sugar. Viitamins and chelated minerals and are rich in Omega-3 and Omega-6 fatty acids for healthy skin and coat. PetGuard was founded in 1979 as the first all-natural pet food company. PetGuard is family-owned and focused on bringing quality, natural nutrition to your pets. Made in the USA. INGREDIENTS: TURKEY, TURKEY BROTH, TURKEY LIVER, RICE FLOUR, DRIED EGG PRODUCT, GUAR GUM, DICALCIUM PHOSPHATE, POTASSIUM CHLORIDE, DRIED KELP, TAURINE, CHOLINE CHLORIDE, DL-METHIONINE, YUCCA SCHIDIGERA EXTRACT, MENHADEN FISH OIL (PRESERVED WITH MIXED TOCOPHEROLS), MAGNESIUM SULFATE, IRON AMINO ACID CHELATE, ZINC AMINO ACID CHELATE, VITAMIN E SUPPLEMENT, THIAMINE MONONITRATE, COPPER AMINO ACID CHELATE, MANGANESE AMINO ACID CHELATE, SODIUM SELENITE, NIACIN SUPPLEMENT, D-CALCIUM PANTOTHENATE, PYRIDOXINE HYDROCHLORIDE, RIBOFLAVIN SUPPLEMENT, VITAMIN A SUPPLEMENT, BIOTIN, POTASSIUM IODIDE, VITAMIN D3 SUPPLEMENT, VITAMIN B12 SUPPLEMENT, FOLIC ACID. 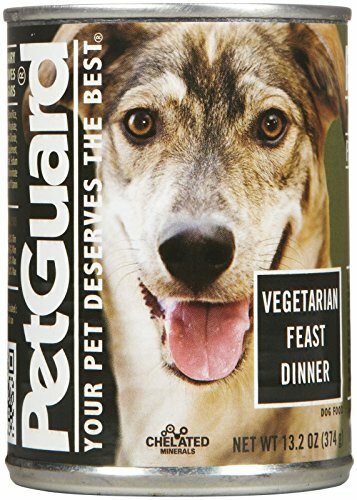 PetGuard Vegetarian Feast Dinner canned dog food is a complete vegetarian diet containing everything your dog needs without any of the ingredients you want to avoid. Free of animal proteins and by-products, artificial flavors, colors, preservatives, sweeteners and sugar.Our formula contains Vitamins, chelated minerals and it is rich Omega-3 and Omega-6 fatty acids for healthy heart, liver, kidneys, skin and coat.PetGuard was founded in 1979 as the first all-natural pet food company. PetGuard is family-owned and focused on bringing quality, natural nutrition to your pets. Made in the USA. INGREDIENTS: WATER SUFFICIENT FOR PROCESSING, SOYBEAN ,MEAL, SOYBEAN OIL, BROWN RICE, WHEAT GERM MEAL, OATMEAL PEAS, CORNMEAL, CARROTS, GUAR GUM, DEFLUORINATED TRICALCIUM PHOSPHATE, BREWERS DRIED YEAST, POTATOES, CALCIUM CARBONATE, CHOLINE CHLORIDE, SUNFLOWER OIL, POTASSIUM CHLORIDE, YUCCA SCHIDIGERA EXTRACT, ZINC AMINO ACID CHELATE, IRON AMINO ACID CHELATE, SALT, VITAMIN E SUPPLEMENT, COPPER AMINO ACID CHELATE, MANGANESE AMINO ACID CHELATE, NIACIN, D-CALCIUM PANTOTHENATE, SODIUM SELENITE, VITAMIN A SUPPLEMENT, RIBOFLAVIN SUPPLEMENT (VITAMIN B2), BIOTIN, THIAMINE MONONITRATE (VITAMIN B1), CALCIUM IODATE, PYRIDOXINE HYDROCHLORIDE (VITAMIN B6), ERGOCALCIFEROL (SOURCE OF VITAMIN D2), VITAMIN B12 SUPPLEMENT, COBALT AMINO ACID CHELATE, FOLIC ACID, INOSITOL. Yeast and Garlic Wafers, given as a treat or reward, will nourish and strengthen your pet naturally with protein and the essential B-Complex Vitamins. Used regularly, Yeast and Garlic will help your pet be healthier, happier, more disease resistant and less prone to problems associated with infestation. Made with human-grade ingredients. Our Yeast and Garlic products help your pet to maintain a healthy appetite and protect against anemia. Yeast and Garlic not only supply B Vitamins but also are a valued source of trace minerals and B-Complex Vitamins. Protein and trace minerals are essential nutrients necessary for enhancing your pet's vitality and stamina and work to build your pet's natural immune system. PetGuard was founded in 1979 as the first all-natural pet food company. 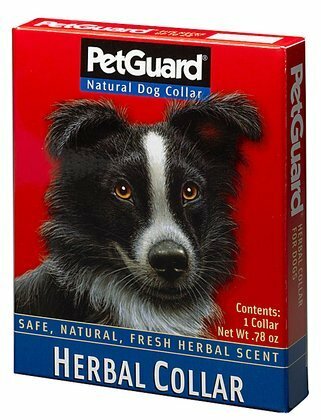 PetGuard is family-owned and focused on bringing quality, natural products for your pets. Made in the USA. 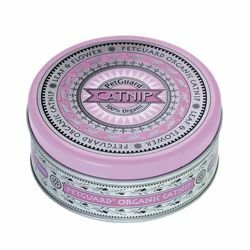 Pet Guard Organically Grown Catnip Cat Treat - Tin, 1.75 Ounce - 6 per case. The Very Best IngredientsEach unique dinner is prepared from wholesome ingredients including meat, fish, chicken, vegetables and fresh-milled whole grains. Each dinner is specifically formulated and correctly balanced with the proper amount of protein, fat, carbohydrates, vitamins and chelated minerals, avoiding excess sodium, magnesium and other nutrients that may harm pets. You will not find By-Product ingredients in PetGuard Premium. Just good wholesome food.Taurine: An Essential Amino AcidTaurine is an essential nutrient in a cat's diet to help prevent heart disease and blindness. PetGuard Premium food products are an excellent resource of taurine, derived from selected natural sources such as meat, eggs, chicken and fish.High Digestibility: PalatabilityPetGuard's choice of wholesome, fresh ingredients helps create a food that is highly digestible with a great taste and texture that will satisfy the most finicky appetite. Because our products are highly digestible your cat will have smaller, firmer stools with less odor.No Artificial Flavors or ColorsOur ingredient specialists ensure that PetGuard Premium foods are free of artificial colors, flavorings, or preservatives.The Natural ApproachWe recommend varying your cat's diet occasionally by adding portions of fresh meat and vegetables as a part of a natural approach to nutritional well being. PetGuard LifeSpan - Fresh ChickenPetGuard Premium LifeSpan is the first all natural premium food for dogs of all ages, sizes and breeds. These crunchy nuggets provide your dog with optimum nutrition in a scientific blend of real chicken, whole grains, essential vitamins and chelated minerals. No red meat; no by-products. PetGuard Premium LifeSpan is completely free of corn, soy, wheat and yeast. 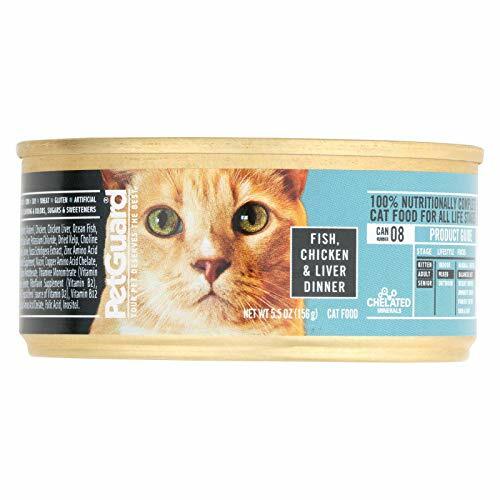 Pet Guard Fish Chicken and Liver Dinner Canned Cat Food, 5.5 Ounce - 24 per case. 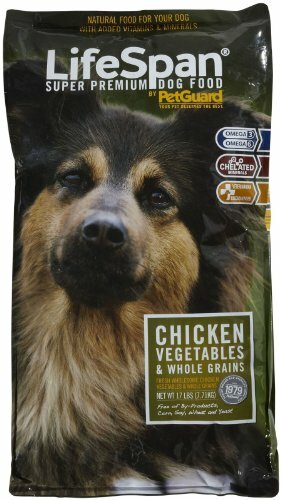 A wholesome, meat-free meal, PetGuard Organic Vegetarian Vegan Entree Canned Food for Dogs uses a precise and superior blend of wholesome organic grains, vegetables and fruits to deliver natural nutrition and taste. Ideal for adult dogs with allergies to beef, pork, poultry and dairy, this organic, natural and vitamin-bursting recipe uses choice, organic ingredients with no by-products, sweeteners, corn, soy, wheat or yeast or artificial colorings or flavors. People today are concerned with the important relationship between nutrition and their health. We are all concerned about the actual ingredient sources, seeking products free of artificial ingredients, colors, preservatives, excess sugars and salt. At PetGuard, our concern for minimizing toxic chemicals in our environment and sensitivity for improving our lifestyles extends to our pets as well. Preventive health care can help add to the length and quality of your pet's life too. All pets deserve the benefits from a lifestyle of optimum nutrition, exercise and regular veterinary visits. The PetGuard philosophy embodies a commitment to you and your pets to provide only natural alternatives for a healthier environment and lifestyle. Our complete line of pet care products offer discriminating pet owners the opportunity to provide their pets with the same healthy benefits that we all seek for ourselves. 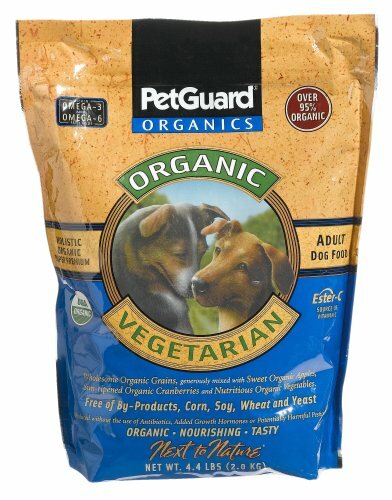 Feeding Guidelines for PetGuard Organic Vegetarian Vegan Entre Canned Food for Dogs: Feed 3/4 to 1 1/4 cans per 15 lbs of body weight per day. Amont of food will depend on activity, age, environment and breed. Feed at room temperature and refrigerate unused portion. Always provide access to clean fresh water. 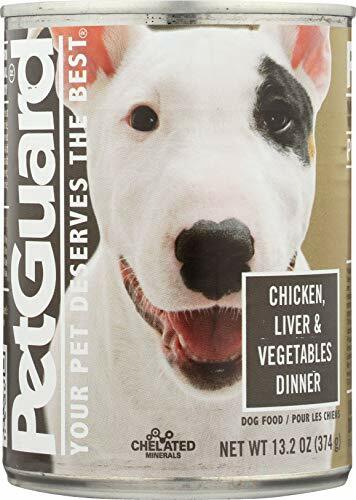 PetGuard Liver, Vegetable & Wheat Germ Dinner Canned Dog Food, 13.2-oz, case of 12; Since 1979, PetGuard has practiced the philosophy, which embodies the commitment to you and your pets, to provide only natural alternatives for a healthier environment and lifestyle. Their natural pet care products offer the discriminating and conscientiously concerned pet parents the opportunity to provide pets with the same health benefits that we all seek for ourselves. Meals for puppies, adults, seniors and less active pets. Dinners are prepared with fresh-milled grains, vegetables, meat or chicken. All dinners are free of by-products, artificial flavors, colors, preservatives, sweeteners or sugars. PetGuard's canned flavors are going through a packaging change, so you not receive the same can pictured online, but the quality ingredients have remained the same. PetGuard has developed an excellent formula made especially for dogs who require additional vitamins and minerals. The nutrients have been derived from the most natural sources?starting with Acidophilus, Bee Pollen, Brewers Yeast and with essential vitamins and minerals, including Calcium and Zinc. PetGuard MultiVitamin complements the nutritional benefits of our other fine supplements. 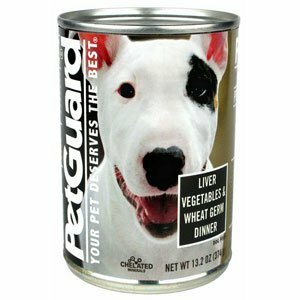 PetGuard Liver, Vegetables & Wheat Germ Dinner canned dog food is a complete diet containing everything your dog needs without any of the ingredients you want to avoid. Real chicken from cage-free, hormone-free chickens is the first ingredient. Nutritious and delicious recipe contains ethically-sources wholesome ingredients including chicken liver, carros, peas, wheat germ, and potatoes. Free of animal by-products, artificial flavors, colors, preservatives, sweeteners and sugar. Viitamins, chelated minerals and are rich in Omega-3 and Omega-6 fatty acids to nourish your dog's heart, liver, kidneys, skin and coat. PetGuard was founded in 1979 as the first all-natural pet food company. PetGuard is family-owned and focused on bringing quality, natural nutrition to your pets. Made in the USA. INGREDIENTS: CHICKEN, CHICKEN BROTH, CHICKEN LIVER, CARROTS, PEAS, WHEAT GERM, POTATOES, BREWERS DRIED YEAST, GUAR GUM, POTASSIUM CHLORIDE, SALT, CHOLINE CHLORIDE, DRIED KELP, YUCCA SCHIDIGERA EXTRACT, ZINC AMINO ACID CHELATE, MENHADEN FISH OIL (PRESERVED WITH MIXED TOCOPHEROLS), IRON AMINO ACID CHELATE, VITAMIN E SUPPLEMENT, COPPER AMINO ACID CHELATE, MANGANESE AMINO ACID CHELATE, SODIUM SELENITE THIAMINE MONONITRATE, COBALT AMINO ACID CHELATE, NIACIN SUPPLEMENT, D-CALCIUM PANTOTHENATE, VITAMIN A SUPPLEMENT, RIBOFLAVIN SUPPLEMENT, BIOTIN, VITAMIN B12 SUPPLEMENT , PYRIDOXINE HYDROCHLORIDE, POTASSIUM IODIDE, VITAMIN D3 SUPPLEMENT, FOLIC ACID. 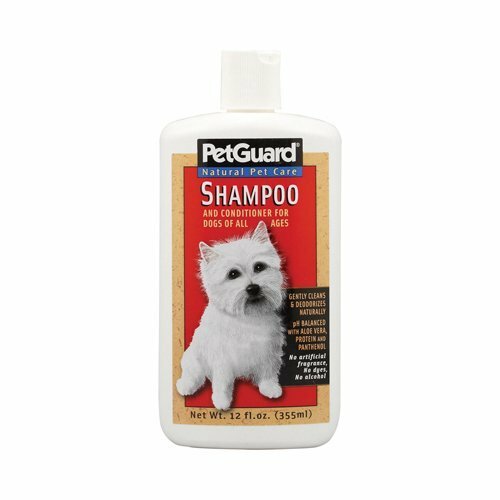 Pet Guard Shampoo and Conditioner for Dog, 12 Ounce - 6 per case.